Whether your AR-15 is chambered for .223 Rem or 5.56 NATO, you can practice your marksmanship at the range with this 62 grain FMJ ammo from Tula Cartridge Works. Many shooters have enjoyed the savings of using steel-cased ammo for their frequent trips to the rifle range, and for good reason: it's a great value! Most of us don't have the time to reload our spent casings, and this ammo has a great reputation with shooters for reliable feeding and solid accuracy. Russian emperor Peter the Great founded the Tula Arsenal in 1712 to produce weapons to protect Russian citizens from invasion. In 1880, Emperor Alexander II had the Tula Cartridge Works factory built to add to the area's impressive national defense legacy. 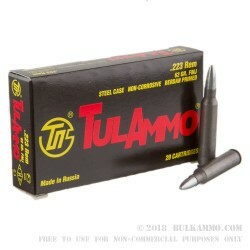 The TulAmmo brand represents a large share of steel cased ammunition available today in the world. With over a century of experience developing ammunition meant to stand up to extreme conditions, Tula = tough! Colt AR15 LE model ate this stuff like candy and place the rounds within a very comfortable on a 70 yrd target. Great price. Not the cleanest ammo but what can you really expect for the price. Those who complain about Sub MOA accuracy.....if your gun doesn't shoot a large variety of different ammo manufacturers of the same caliber maybe it's time to review your gun a bit more. And really???? sub MOA accuracy.....if you're a sniper then get a caliber with better punch through power and stop trying to justify your mistake in spending so much for a weapon that's too particular and not that useful anyway. I ordered the 1000 rd case to use as the first fired ammo through my Colt AR15 Law Enforcement Carbine and it did perfect shot after shot. But the accuracy leaves some room for improvement. Used as a plinker or spray defense it is perfect. 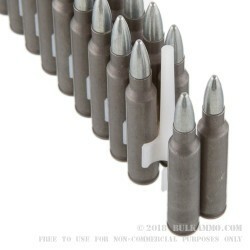 If anyone shooting this ammo has problems with the feeding or cycling then buy a better gun. Just because you pay high dollar for one doesn't mean you have one!!! There are many toss away model guns that would shoot any ammo fed into it. Shot 500 rounds from a mini-14 with not ONE FTF. Cheap, reliable, powerful and accurate. What more does Bubba need to say? How do you give 5 stars on ammo performance and reliability then say you haven't fired any yet? 1 star on performance and reliability just to offset the knucklehead that reviewed before me - the price is clearly great if its decent rounds. Very fast service, ordered on late on Tuesday night, received Friday morning! First time ordering from Bulkammo.com and definitely will order here again! Q: Is there any lacquer or other coating that will leave a residue in the works...? A: Hello! Tula ammunition uses a polymer coating that does not leave any residue. 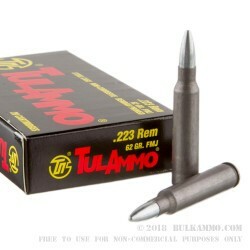 A: The steel cases used in this Tula ammo should not be reloaded. Q: what's the difference in round performance between steel and brass cased ammo? A: This depends on the manufacturer and the pressure levels that the ammo is loaded to. Brass cased 5.56 ammo will be faster and considered higher performance ammo than this Tula .223 ammo, but that is mostly due to the fact that it is loaded to 5.56 pressures. Comparing apples to apples, the accuracy and reliability of this Tula ammo will compare favorably to lightly loaded .223 ammo. Q: Brass is much softer than steel, so will I have issue if I shoot thousands of this steel ammo through my rifle? A: The steel used in these cases is much softer than the hardened steel of your weapon's bolt and barrel. It will not cause excessive wear. Q: Is there any need to clean the weapon more often due to corrosive primer with this manufacture of ammunition? A: This ammo is not loaded with corrosive primers. Q: Will steel cased ammo mess up my gun? A: There are pressures and temperatures involved in the firing of small arms ammunition that far exceed the ability of a mild steel case to cause wear to hardened steel components. In other words, no, steel cased ammo will not mess up your gun. Over time, shooting your gun will mess up your gun - but this is true for any ammo. Parts will wear or break and need to be replaced. A: AR-15s with a 1/7 twist rate will stabilize a wide range of projectiles. This Tula 62gr ammunition is just about in the middle of that range. Stabilization is based on the length of the projectile, not necessarily the weight, for different jacket and core designs and materials will result in different projectile lengths with the same weight. Q: Where is Tulammo manufactured and are these rounds re-loadable? A: This Tula .223 ammunition is loaded at the Tula Cartridge Works in Russia, which has produced ammunition for various eastern bloc militaries for many years. They should not be considered reloadable. Q: My gun has a 1-9 twist rate. Can I shoot these heavier grain bullets? If yes, are there downsides or problems with doing so? Thanks! 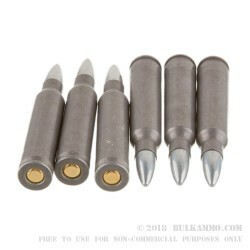 A: Yes, an AR-15 with a 1/9 twist rate will stabilize these Tula 62gr projectiles to the maximum effective range that your barrel length will allow. A: The bullet used in this Tula 223 ammo has a bimetal jacket, which is composed of copper over steel over copper. It will attract a magnet. Q: I see that this ammo is steel cased and boxer primes. I want to know if this is re-loadable? I don't think that it is. A: No, this Tula ammo should not be considered reloadable.